You know how just as you’re getting into the weekend, it’s already Sunday afternoon? There just aren’t enough hours in the day to do everything and certainly never enough on the weekend to get everything done plus have time to relax. That’s why I’m always on the lookout for recipes that I can make on the weekends and then divide up for lunches or quick dinners during the week. 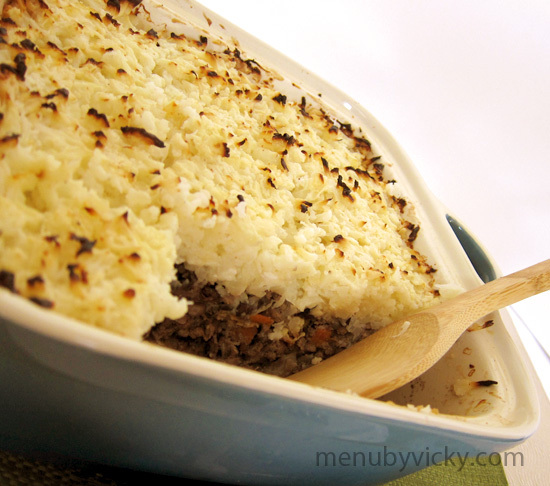 The recipe for cauliflower shepherd’s pie was posted by my friend Rebecca over at Rapunzel’s Adventures. If you haven’t been over to her blog, you should definitely have a look. She’s got a lot of posts on exercise routines along with videos that show you how they’re done. So make sure you bookmark her site on your smart phone and take it along with you the next you hit the gym. Cauliflower isn’t something that I eat very often and it’s not something I would normally associate with shepherd’s pie. I decided to look into cauliflower a little bit more. It turns out that it’s commonly used by people on low carb diets because it’s similar in texture to potatoes, minus the carbs. This recipe is great for anyone who’s looking to increase their protein intake and their consumption of veggies. The only difference between this and a real shepherd’s pie is the cauliflower/cottage cheese topping which replaces the mashed potato and butter. You get in a good dose of veggies from the cauliflower, mushrooms and a mix of peas, carrots and corn along with a lot of protein from the cottage cheese, extra lean ground beef and black beans. Give this recipe a try and let me know if you miss the potatoes. Enjoy! Drain the black beans in a strainer and rinse until the water runs clear. Cut cauliflower into florets, place into boiling water and cook for about 6-10 minutes or until soft. Allow to cool. In a frying pan, add a tablespoon of canola oil and sauté onions over medium heat until translucent. Add the crushed garlic and continue cooking for another minute or two. Add the extra lean ground beef to the frying pan, break apart the meat and continue cooking until the meat is browned. Add the mushrooms, black beans along with the corn, carrot and pea mixture and cook until softened. Add the oregano, thyme and Worcestershire sauce and stir into mixture and cook over low heat for another 7-10 minutes. Add the cottage cheese to the cauliflower and mash until combined. Season with a pinch of nutmeg and salt to taste. Place the cooked ground beef and vegetables into a baking dish and top off with the cauliflower and cottage cheese mixture. Bake in the oven at 350F for approximately 25-30 minutes or until bubbling and brown. You can turn on the broiler towards the end if you wish to brown the top. Recipe notes: To save time, you could use frozen cauliflower instead of fresh. You can add in a splash of red wine or beef stock to the ground beef for extra flavor if you wish. 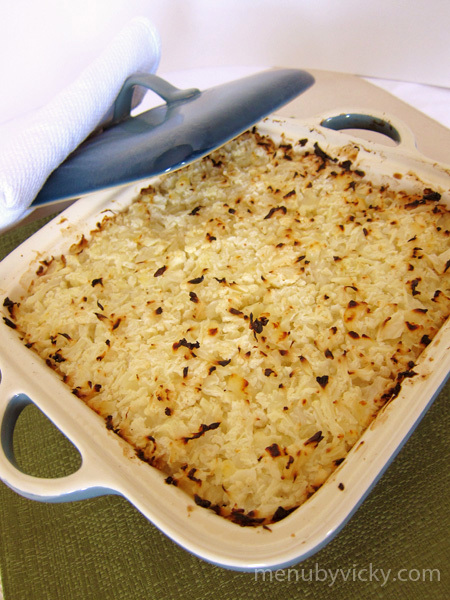 If you use the broiler to brown the top of the shepherd’s pie, be careful not to step away from the oven as the top can quickly burn. Love it! Thanks for including photos of how it turned out too. I love the changes you made to it. Carrots add a lot of carbs but they’re not the same as the carbs you’d get from potatoes and often the argument could be made that the nutritional value from the carrots outweighs the extra carbs, whereas you can’t say the same for white potatoes (and not usually sweet potatoes either). This looks soooo good! I have been using cauliflower a lot lately as a replacement for starches. Have you tried cauliflower rice? Amazing! 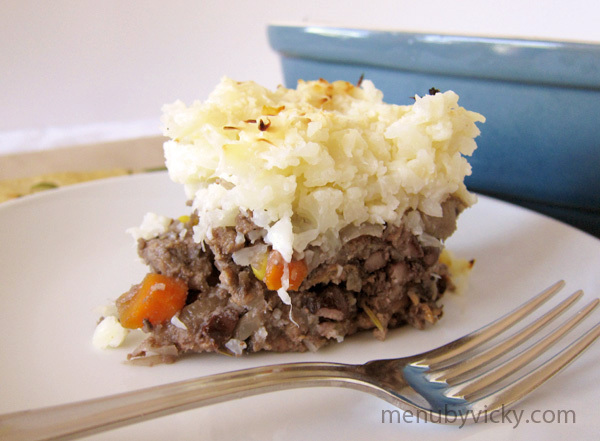 How perfect for a shepherd’s pie! Thank-you 🙂 No I haven’t tried cauliflower rice but it sounds like it’s similar to the topping on the shepherd’s pie I think (minus the cottage cheese). I have some leftover cauliflower so I’m going to give that a try too! You just put some cauliflower in a food processor or blender and pulse it until it is the consistency of rice. It is sooo good! I have made fried “rice” with it and also use it as a pasta substitution a lot. Gorgeous! What a clever incorporation of cauliflower into an otherwise classic dish. Impressive innovation! Thank-you! It was pretty easy so one that I’ll be making again in the future. My wife and I are really trying to eat less carb … that looks like a nice recipe! Oh yum! What a combination! How innovative! Oh wow this looks good, I dont eat potatoes and use cauliflower all the time- cannot believe I did not think to do it with Shepard’s pie! Thank you! The cauliflower is a great substitute. Let me know how it turns out if you give the recipe a try!